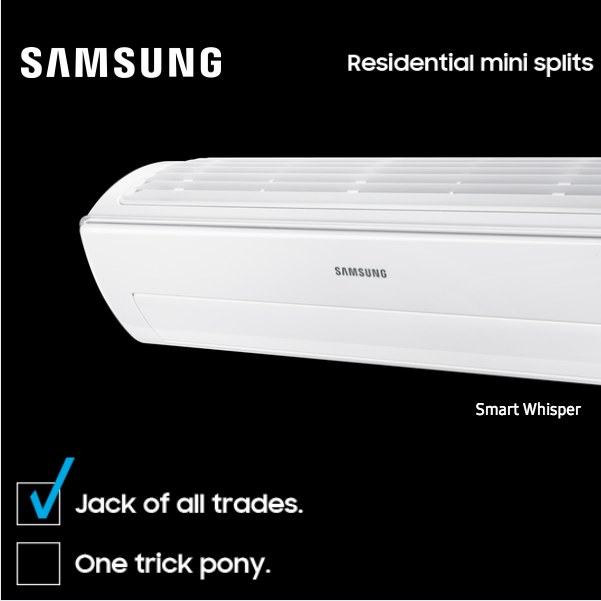 More on Samsung Mini Splits — Harbin Heating & Air Conditioning, Inc. This week, we are featuring Samsung’s Residential Mini-Split Systems. These are a great way to provide your home with an energy-efficient cooling system that doesn’t completely bust your wallet! While a central air conditioning unit can require loads of ductwork to be added to your home--which can be exorbitantly expensive--these mini-splits are a completely duct free system. Mini-split A/C systems have several advantageous qualities. They are simpler in design than traditional set-ups and easier to upkeep and clean. They offer an extra layer of control by focusing each segment on a smaller, targeted area. They are quieter than your standard A/C unit, and take up less space. Mini-splits can also save you money! They are cheaper to install than a full system, and cheaper to use than a window unit. By eliminating the ductwork and minimizing the space through which treated air is running, mini-splits help to cut down tremendously on energy costs. Samsung’s Residential Mini-Split is the perfect answer for anyone who’s looking to add some extra temperature control to their house. With its wi-fi system and app-supported set up, you can control your temperature settings before you even get back to the house. If you have recently added on rooms, have small spaces that need a little extra help, or just want to have more control over your own space, look no further than a Samsung Residential Mini-Split. Check out the Samsung Residential AC Homeowner’s Guide for Mini-Splits here. Harbin Heating & Air Conditioning, Inc. is dedicated to helping our customers figure out the best systems for their needs. We install, repair, and maintain HVAC units for all types of homes and businesses. If you are thinking about updating your systems, call HHA today at 731-689-3651 and set up your consultation!